Visitors can learn about the King and the oil boom and enjoy spring foliage in Gladewater-Longview. When you take a road trip in Texas, no matter your mental or written list of places to see and things to do, you’re not traveling right if you don’t find attractions that are not listed in Chamber of Commerce brochures. For instance, during a three-day visit to Gladewater-Longview (the two Gregg County communities are only 13 miles apart), my companion Beverly and I found ourselves standing outside Room 104 at the Res-Mor Motel (get it? “Rest More”) in Gladewater. But it wasn’t because we had spent the night there or planned to. Built in the early 1950s, the motel is a relic of the pre-interstate days when U.S. Highway 80 carried heavy east-west traffic across East Texas. While no sign or historical marker commemorates this motel’s most famous guest, his more fanatical fans know its significance: On the road to becoming a rock ’n’ roll legend, Elvis Presley stayed in this room at various times in 1954–55. As a young disc jockey at Gladewater’s KSIJ, Tom Perryman made extra money by booking entertainers he viewed as up-and-coming. One day in 1954, he got a call about a trio who had been playing on the Louisiana Hayride in Shreveport — Elvis, guitar player Scotty Moore and bass man Bill Black. They were broke, looking for gigs. Elvis Presley played his first paid Texas gig in Gladewater and often stayed at the Res-Mor Hotel. Perryman (the 88-year-old former longtime Nashville resident now lives in Tyler) arranged for Elvis and his band to play at a long-vanished venue in Gladewater called the Mint Club. That happened on Nov. 23, 1954, and was Elvis’ first paid gig in Texas. In fact, before that time, the yet-uncrowned King had never been before a ticket-buying audience outside of Tennessee or Louisiana. For the next several years, until his career really took off, Elvis periodically spent time in Gladewater. Sometimes he stayed at the Res-Mor in his favorite Room 104 for a week, playing schools, oil company camps and beer joints all over that part of Texas. But the future rock ’n’ roll superstar did not work all the time. Between gigs, he had no trouble making friends with local girls. 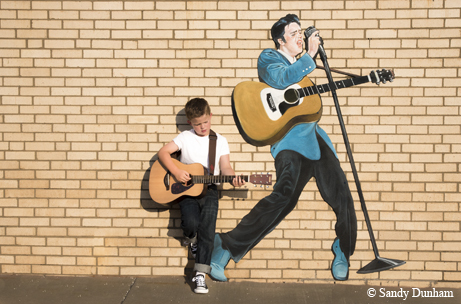 Elvis has forever left the building, but visitors can learn more about his Gladewater days at the Gladewater Museum. It’s open from 10 a.m. to 4 p.m. on Fridays and Saturdays and other days by appointment. At that museum, you also will learn that both Gladewater and Longview were just quiet railroad stops until 1931, when the storied East Texas oil boom transformed this part of the state. For a time, the frenzied crude production emanating from the “Black Giant” — as the 140,000-acre East Texas oilfield was known — isolated the region from the economic depression wracking most of the rest of the state and the nation. While oil play shaped this area, not everything in Gregg County has to do with energy production. Beverly and I easily found three days’ worth of interesting things to do in the Gladewater-Longview area. Tyler State Park is less than a half-hour’s drive west, with a cool, 64-acre spring-fed lake, 100-foot-tall trees and historic structures. A 45-minute drive to the east lands you at Martin Creek Lake State Park, where the fishing is phenomenal year-round, as well as boating, camping and wildlife watching. First, we wanted to check out these fascinating towns. We began our next morning with a visit to the Historic Farmer’s Market in downtown Longview. The Saturday morning market offers locally grown veggies and fruit. Our next stop was the Gregg County Historical Museum. Housed in the 1910-vintage Everett Building, which for years was home to Citizens National Bank, the museum highlights Longview’s beginnings as a railroad town and goes on to document the oil boom’s impact. Art aficionados also will enjoy the Longview Museum of Fine Arts. In addition to changing exhibits, the museum — opened in 1958 — has a permanent collection of more than 300 paintings and other pieces of art. We headed off to Gladewater for lunch at the Tumbleweed Steakhouse. Pleasantly full, we rolled out to see if we could explore all the antique shops and malls in town before closing time. Sunset reflects off the waters of Lake Gladewater. Gladewater bills itself as “The Antique Capital of East Texas,” and with more than 200 dealers in town, that is not hyperbole. Downtown is basically one antique shop or mall after another, so wear walking shoes if looking for treasures from days of yore is your thing. In addition to the antique places, be sure to check out Gladewater Books, a mom-and-pop used bookstore owned by Betty DeRieux and Peter Adams. Their books are many and varied, and nondigital. While you’re walking around this one-time boomtown, if you think you’ve burned off enough calories to justify a mid-afternoon snack, stop by the Fork Bakery on Main Street. We took a coffee break there. As tasty as the bakery goods looked, we toughed it out and stuck with just our cups of joe. If you want to snap a selfie while standing in front of what you could tell your friends is your oil well, head to the large metal derrick that rises near the railroad tracks that run through town. It makes a great background for a shot that will make you look like a real-deal Texan, ideal for Facebook posting. After checking out the last antique store, we headed back to Longview to rest our feet and decide where to have that evening’s supper. We agreed to try Dudley’s Cajun Café. It was packed when we showed up, and we soon found out why. I had a bowl of shrimp creole, while Beverly enjoyed a blackened crawfish salad. If focusing on Cajun food seems a bit strange, remember that Longview is only 65 miles from Shreveport, La. Beverly, a connoisseur of Cajun, gave the place her stamp of approval. 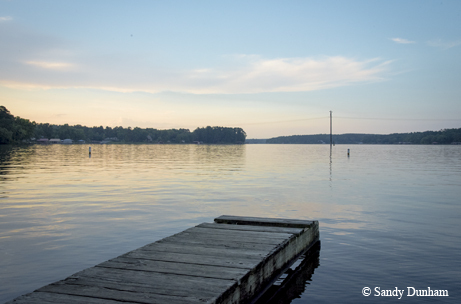 At a leisurely hour the following morning, we drove to Lake Gladewater. Located 20 miles from Longview, the 481-acre impoundment on Glade Creek was built by the City of Gladewater in the early 1950s. It’s considered a good crappie lake. We didn’t fish but did enjoy a good walk. While this lake is the closest fishing hole to this area, Lake O’ the Pines is not far to the north, and southern Gregg County has Lake Cherokee, another good crappie lake. We were in Gregg County in April when East Texas is always dressed in its spring best. But we discovered that we had just missed a special part of spring in this region of the state: the annual daffodil bloom at Mrs. Lee’s Daffodil Garden. While only an oilman or his banker can see beauty in a working rig or tank farm, the money that comes from oil can be used to create universal beauty. During the East Texas boom, Gladewater newspaper and radio station owner T.W. Lee did very well in the oil business. With income flowing as freely as crude, Lee and his wife, Helen, bought a tract of land six miles south of Gladewater. Residents enjoy a walk on the Paul G. Boorman Trail in Longview. Originally, they intended to mine their property for gravel, but that enterprise did not last long. Helen Lee fell in love with their timber-covered holding, and soon she bought adjoining land, bringing their farm to 918 acres. She converted two gravel pits into fish-filled ponds, and she and her husband saw that good conservation measures allowed white-tailed deer and wild turkeys to flourish on the ranch. To further beautify the property, Helen Lee ordered a boxcar full of daffodil bulbs from Holland. Forty workers planted the bulbs over a 28-acre tract, and the distinctive yellow flowers have been blooming every February and March since then. When she died in 1984, a foundation bearing her name took over management of the property. The daffodil garden is open free to the public from 10 a.m. to 4 p.m. seven days a week from mid-February through March or until the daffodils are no longer blooming. Thousands of people visit every year. 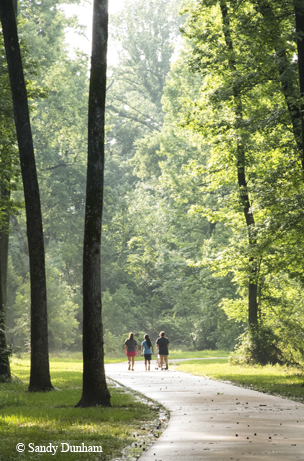 If you like walking, Longview offers more than 10 miles of trails, including trails at Cargill Long Park and along Grace Creek. Another way to get some walking in is to pick up a self-guided tour map of downtown historic sites from the Longview Chamber of Commerce. We wrapped up our Gregg County trip at the R.G. LeTourneau Museum on the campus of LeTourneau University. The exhibits highlight the life of LeTourneau, another person who prospered during the 1930s East Texas oil boom. He did so by gaining various patents for oilfield and earth-moving equipment he invented. From daffodils to derricks to a private university founded by an oilfield innovator, the “Black Giant” left deep footprints in the red dirt of East Texas.